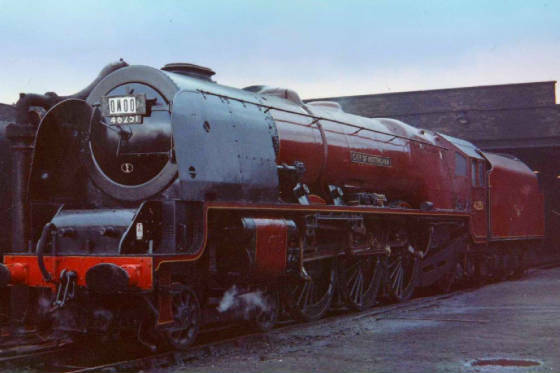 New page - "Annesley "9F's" on passenger workings"
New! 1953 working timetable of the Annesley "Dido"
"Beighton 1942", "Orgreaves 1926", "Bulwell Common 1915" & "Loughborough 1949" just added! A wonderful panoramic view of Annesley MPD (above). 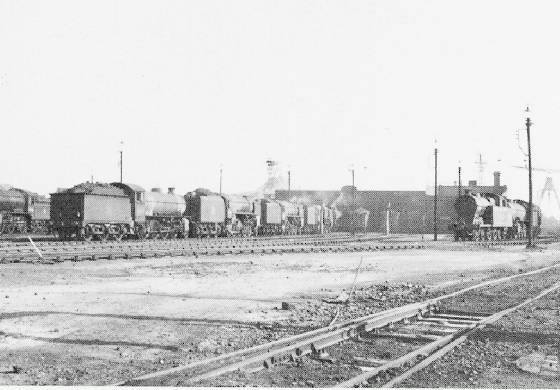 Far left we see the railwaymens' halt Annesley South platform 100 yards in front of Annesley South 'box. 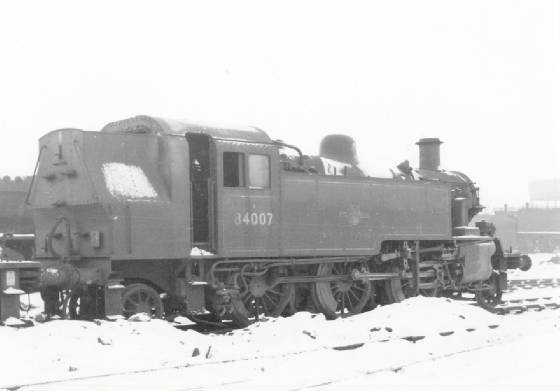 One of our (3) diesel shunters is working the no.3 pilot job, while the rows of withdrawn "O1's" in the background date the photo between September and December 1962 (before the snows came!) 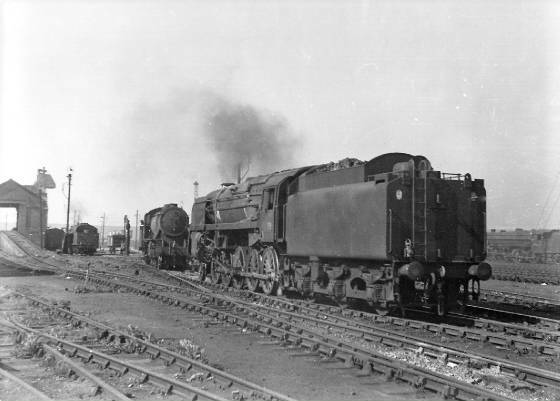 A "9F" is coming off the turntable while an "O4" 2-8-0 is going on shed after being disposed of. A loco crew are walking towards the Sandhouse having left their engine on the ashpits. Jack Bailey's "grab" is fighting a losing battle (as always) with the piles of ash and clinker. 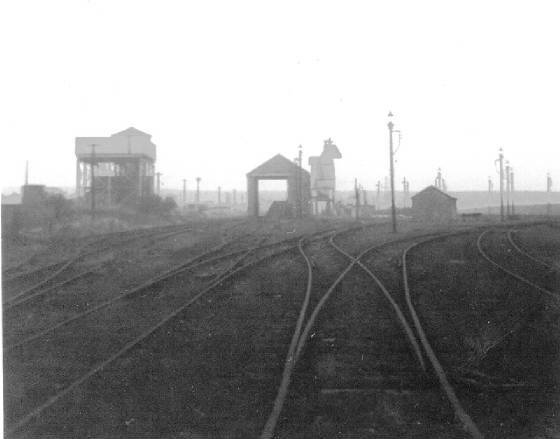 On the right we have the disused Coal Stage, and in the distance (extreme right) you can see Newstead GN signal box. Click HERE to see the ultimate Annesley collection - now over 800 photos! 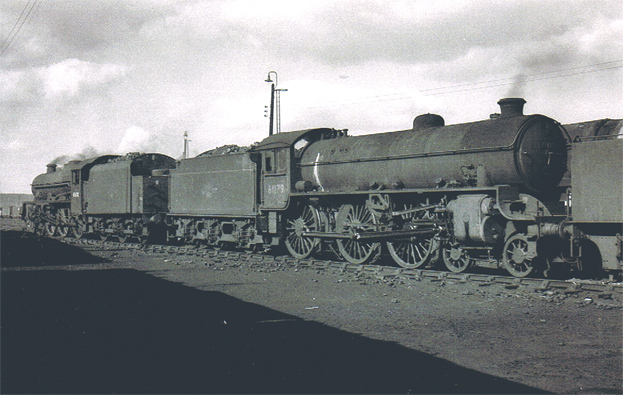 24th June 1962 sees "K3" 2-6-0 no.61857 on the shed front at Annesley. 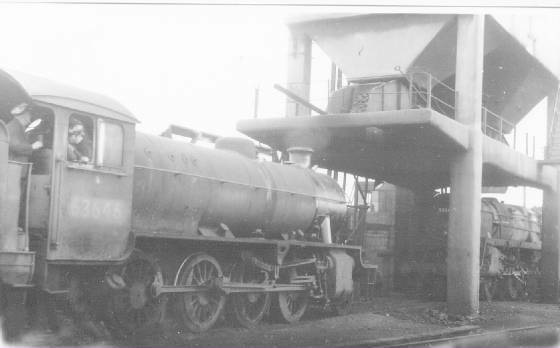 A long-time Scottish region engine, she was now shedded at Hull Dairycoates (50B). 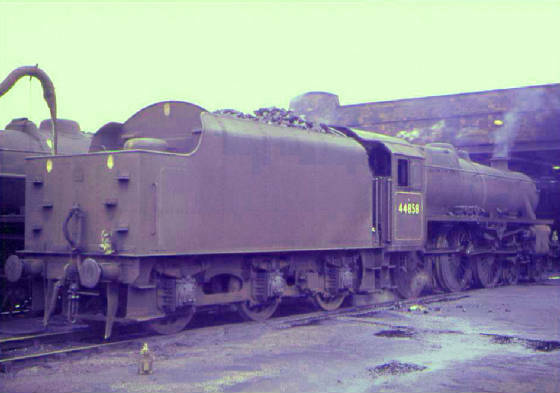 She was withdrawn six months later and cut up at Doncaster Plant in February 1963. 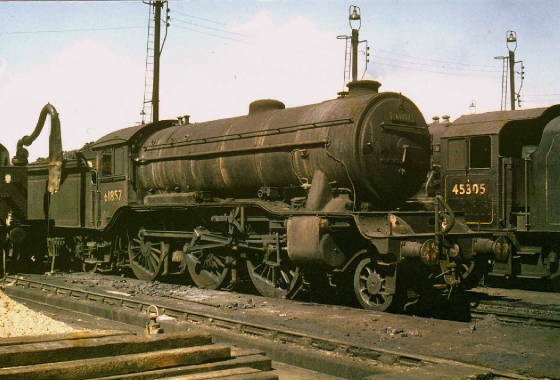 Alongside is Willesden (1A) allocated "Black Five" no.45305 now fortunately preserved. 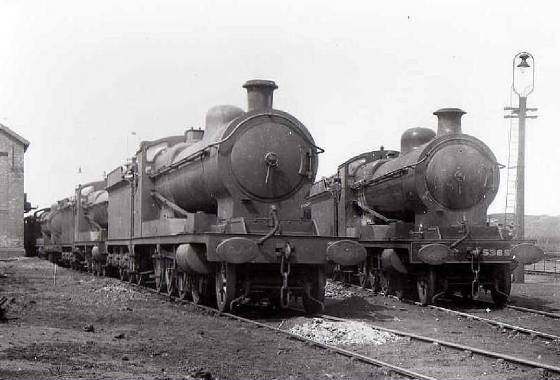 Surely Annesley was one of the few places you could see Hull & Willesden engines side by side! 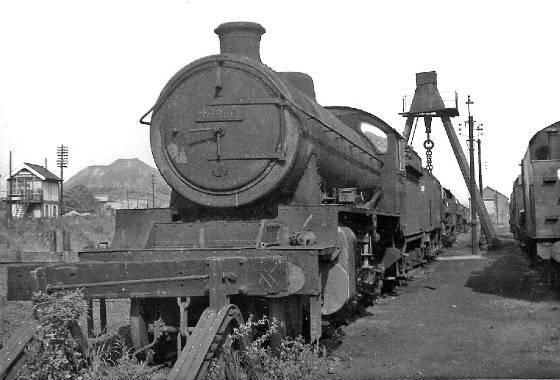 Ardsley (56B) "J39/1" 0-6-0 no.64811 stands on no.7 road waiting for her next turn of duty. This will be the 11.50 Hotchley Hill pick-up (9D14). This was driver Ralph Cumberland's regular turn. After arriving back at 18.35, she will possibly be prepared for 5D38, the 20.30 to Ardsley. Fireman Tony Barker awaits departure for Burton in this 1963 photo. 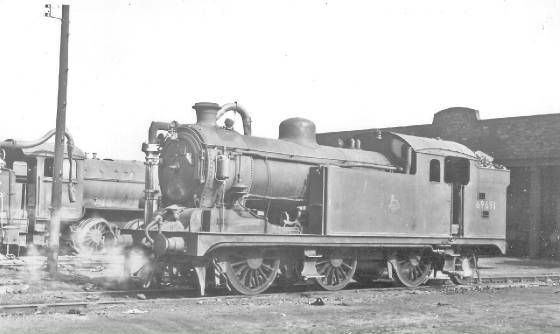 No.5375, the “O4” 2-8-0 on the left was shedded at Annesley from 1915 till she was requisitioned by the War Department in October 1941. 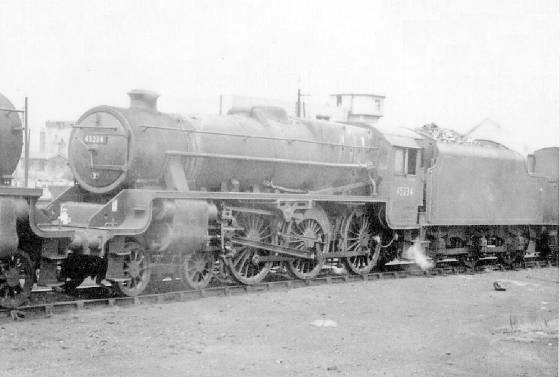 On the right we have another “O4”, no.5385. 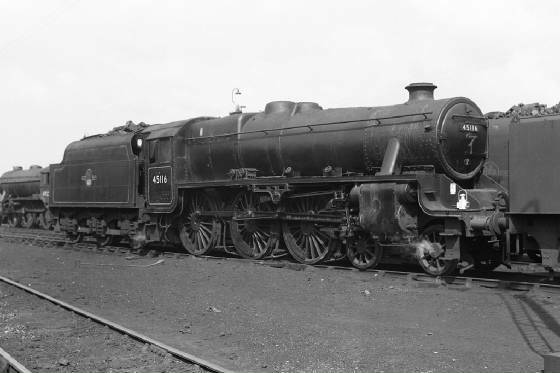 In May 1944 she was rebuilt as “O1” no.63610 and was at Annesley until her premature withdrawal in January 1963. 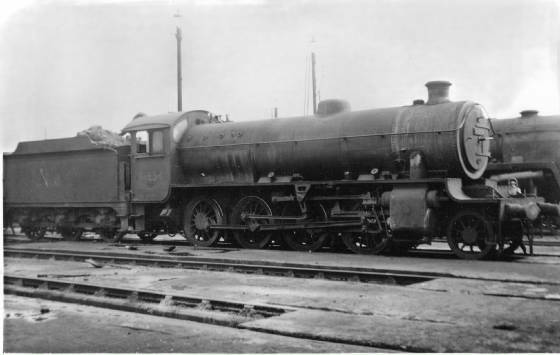 Behind no.5375 stands “Q4” 0-8-0 no.6179. 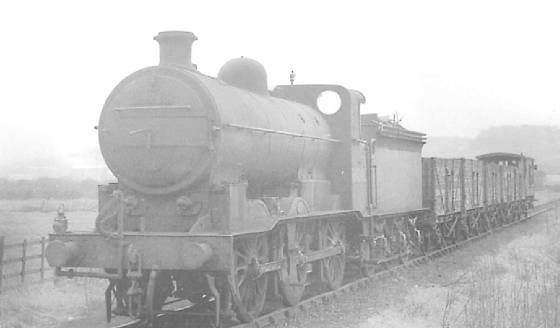 Allocated to Annesley from 1924 to 1936, she was rebuilt in 1945 as a “Q1” 0-8-0 tank engine. 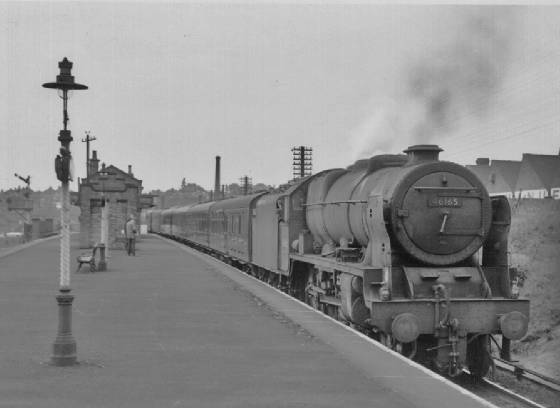 She met her demise at Frodingham in September 1959. Scroll to the bottom to add your own memories of Annesley and/or the GC. All contributions (however small) VERY welcome! Click to hear REAL steam! 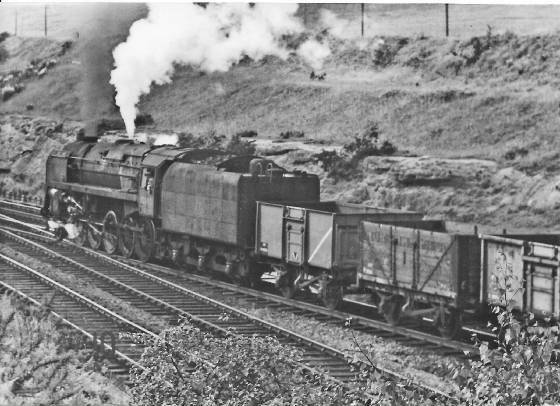 1: "A3" 4-6-2 No.60102 "Sir Frederick Banbury" accelerates the "Master Cutler" after a signal check near Princes Risborough. November 1955. 2: "A3" 4-6-2 No.60050 "Persimmon" restarts the down "South Yorkshireman" out from Aylesbury on a December evening in 1955. 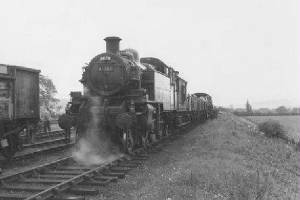 3: Leicester "V2" 2-6-2 No.60831 roars through Princes Risborough with the late-running "Newspapers" on a clammy August night in 1958. Click here for more photos of Annesley MPD. 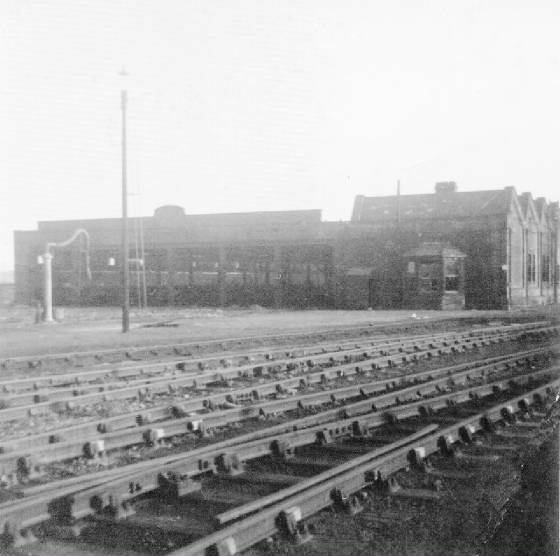 "The shed is on the East Side of the Great Northern Leen Valley Branch (closed to passenger traffic) about two and a half miles north of Hucknall. At this point the L.M.S. 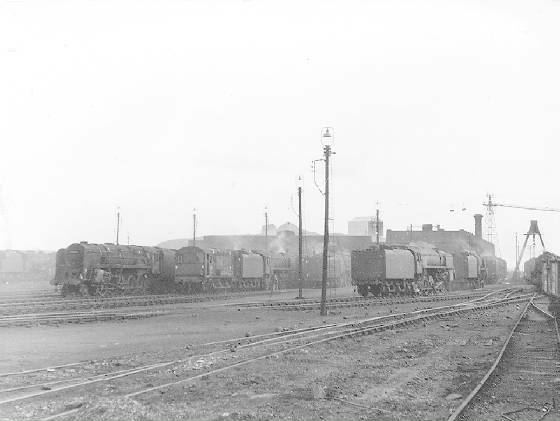 Nottingham - Mansfield, the Leen Valley Branch, and the G.C. Main lines are running parallel. The actual position of the shed is 53.04.20N; 01.12.50W - ANNESLEY"
I first started being interested in trains (i.e.trainspotting) around 1952. 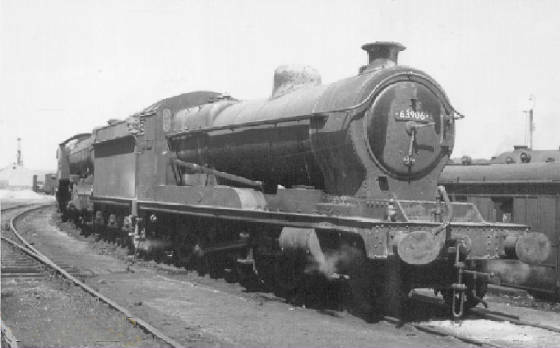 (I know that it was about this time, because one of the first "namers" I saw was "B1" 4-6-0 no.61029 "Chamois" and it was transferred from Sheffield Darnall (41A) to St.Margarets (64A) in September 1953. 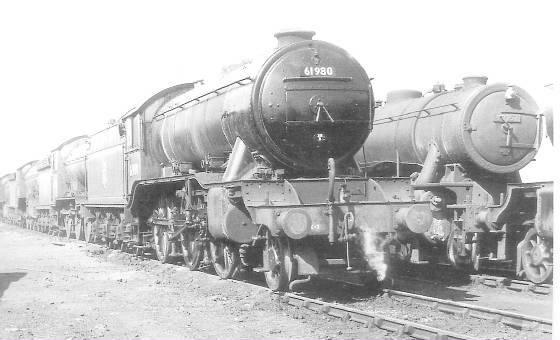 The two other most memorable locos at that time were "B1" no.61066 (which we knew was going to be named "Battle of Hastings"!) 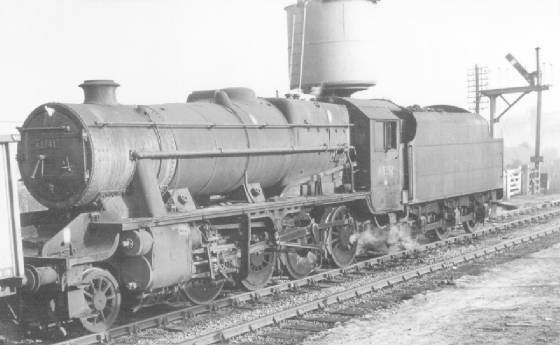 and the "Dido" "C12" tank no.67363. I was seven years old, and used to walk from my home at 27 Abbots Rd, Beauvale Estate all the way down Wood Lane, to Hucknall National Junior School. As I crossed the bridge over the GC I used to wait at around 08.30 for the "Master Cutler" on its southbound journey to London Marylebone. It was usually headed by one of Leicester's (38C) "A3"s, nos. 60049 "Galtee More", 60052 "Prince Palatine", 60054 "Prince of Wales", 60102 " Sir Frederick Banbury", 60104 "Solario" and 60107 "Royal Lancer". If no "A3" was available, it would be hauled by a "V2". 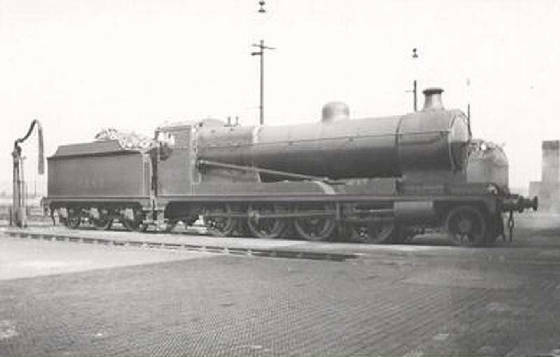 I would then wait for the "twenty to niner", 07.32 Leicester Central to Manchester London Rd (arr.11.15),usually headed by a "V2" 2-6-0. Then it was run like mad to get to school before assembly at 08.55! All my available spare time was spent on the fence outside Hucknall Central Station - I'm sure it never rained in those far-off days! My old "stamping ground"....Hucknall Central. Three views of my trainspotting "patch". 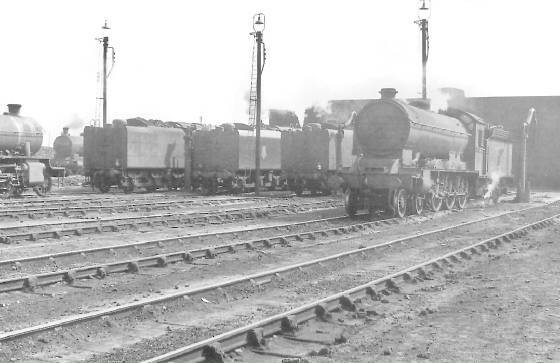 (below left) "A5"4-6-2T 69803 departs from Hucknall Central with a Sheffield Vic - Nottingham Vic local c.1956. (below centre) "D11"4-4-0 62661 "Gerard Powys Dewhurst" lifts her safety valves as she awaits departure with a Sunday working in 1958. 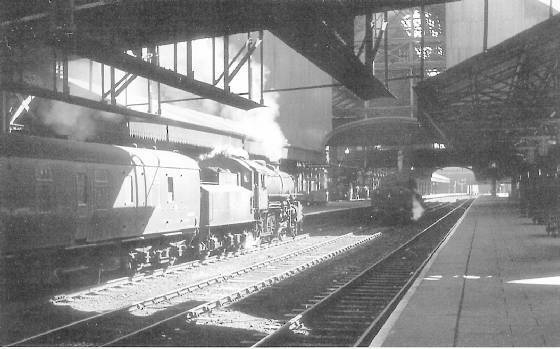 (below right) "B1" 4-6-0 61008 "Kudu" approaches with a Marylebone-Manchester express in 1957. After passing my 11-plus,as a pupil of Carlton-Le-Willows (Nottingham) Grammar School, I was expected to leave school at 16+ having taken my G.C.E’s. Not bloody likely! I begged and pleaded with my mother to send a letter to the headmaster asking for my release on my fifteenth birthday. I suspect he was only too glad to oblige! The only things I was interested in, were girls, sports and rock ’n’ roll. 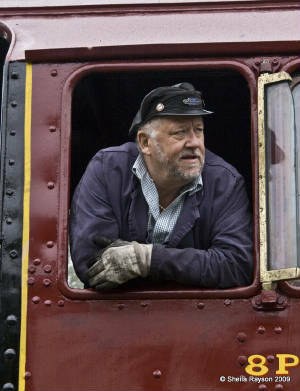 The only job I ever wanted to do was to be an engine driver (didn’t we all! 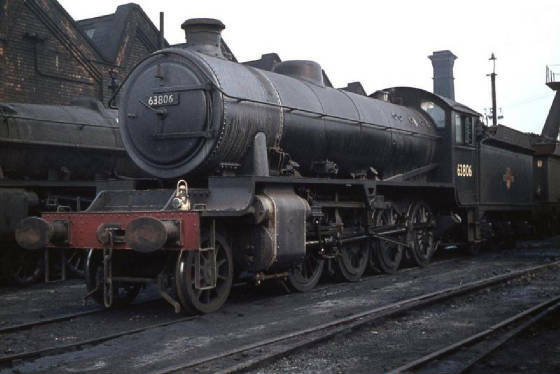 ), so after an brief interview with Mr. Ede, the Shedmaster, and a subsequent medical at Derby, I started my working life at Annesley ( coded 16D,-ex 38B) at 08.00 on January 11th 1960. 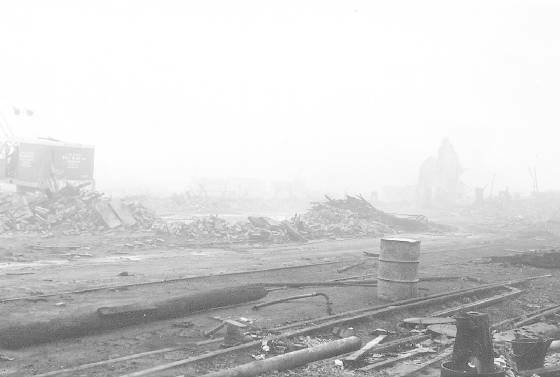 A 1957 view. 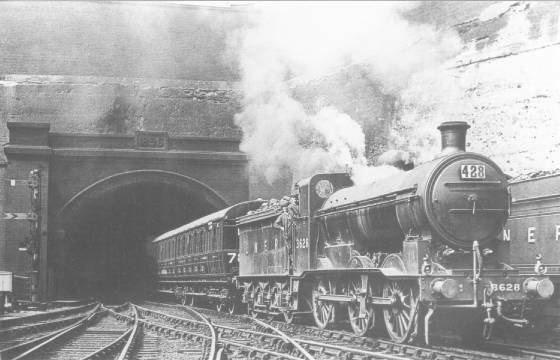 Note the "A5" 4-6-2 tank on the slip road. 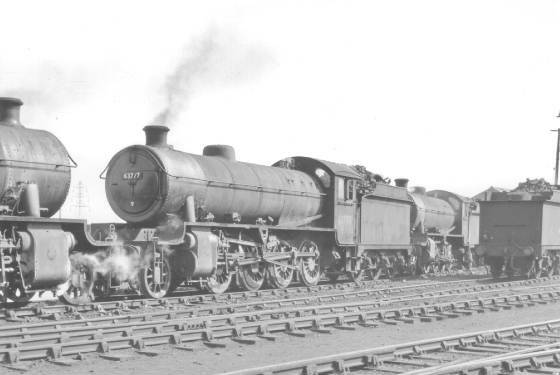 Prior to "Midlandisation" in April 1958, Annesley's allocation was strictly LNER engines. "O1" 2-8-0's worked the Woodford service, "K3" 2-6-0's including 61856, 61975 and 61980 handled the mixed traffic and passenger workings, together with "B1" 4-6-0's 61063, 61066 and 61209. Note all the "O1's" ready for their next Woodford turn. 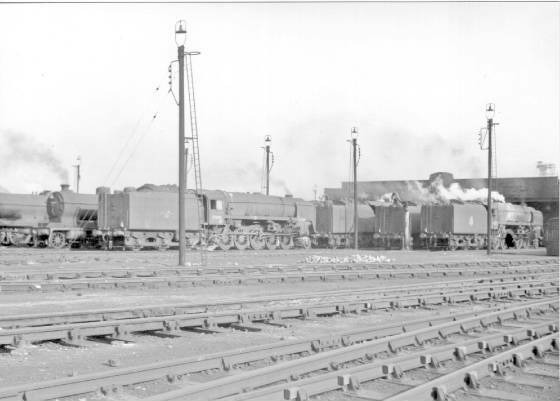 Thirty of the Thomson "O1's" were ousted from Annesley during 1957 with the arrival of an equal number of "9F's", which took over the fast freights to Woodford and more besides. 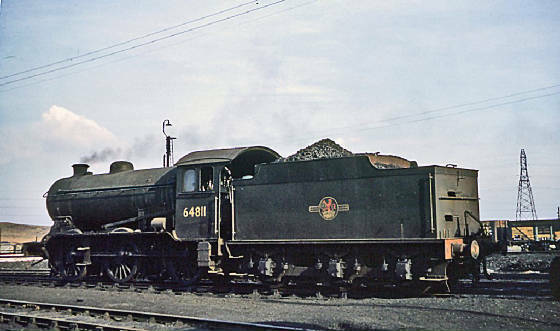 At the end of 1962, under "Midlandisation", the remainder were condemned and replaced by Stanier "8F's"
Ex-GC "Pom-Pom" 0-6-0 no.64386 is backing wagons on to the coaling stage in this c.1956 photo. 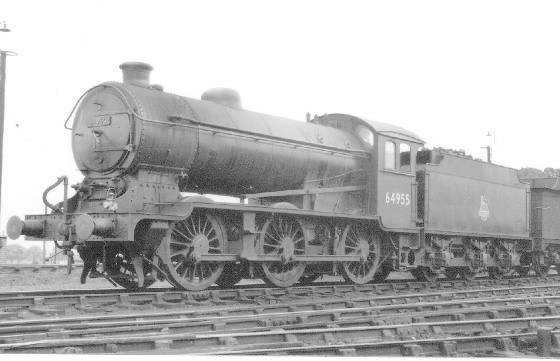 Class "J11" 0-6-0 "Pom-Pom" no.64386 (above) was a Staveley (38D) resident at Nationalisation. She came to Annesley in August 1955 where she stayed till May 1957. She then went to Immingham (40B) from where she was withdrawn in September 1962. She was cut up at Gorton "Tank" three months later. 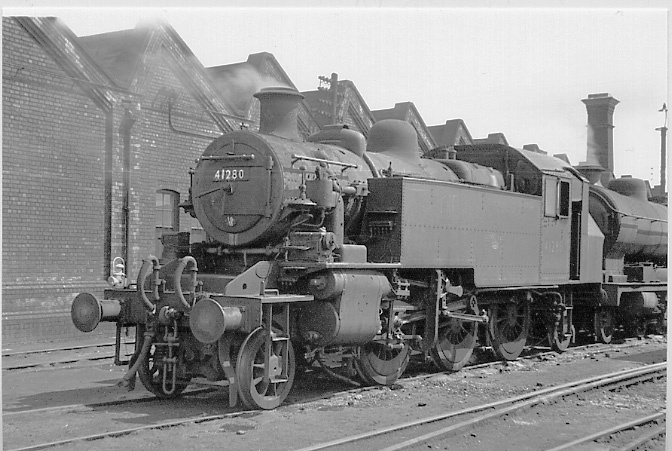 "B1" 4-6-0 no.61063 (above) was shedded at Annesley from 1949 - 1959. She then went to Leicester (GC), Neasden, and then to Woodford. 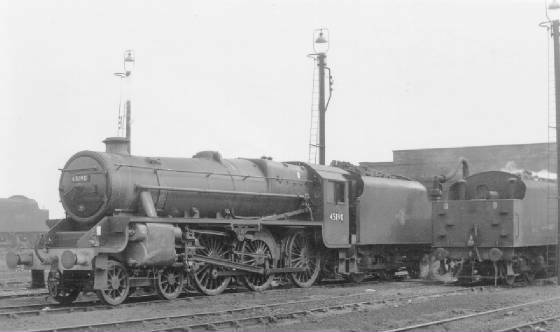 February 1962 saw her placed in store at Leicester. She was broken up at Darlington works in October of that year. 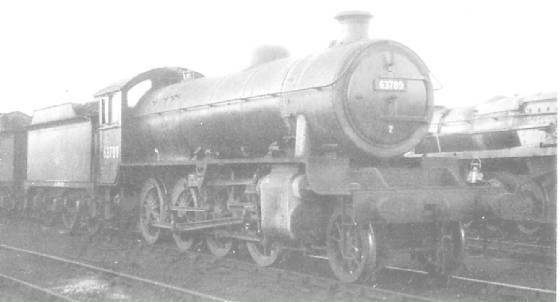 "K3" 2-6-0 no.61856 (below) was an Annesley resident from 1955 to 1959. 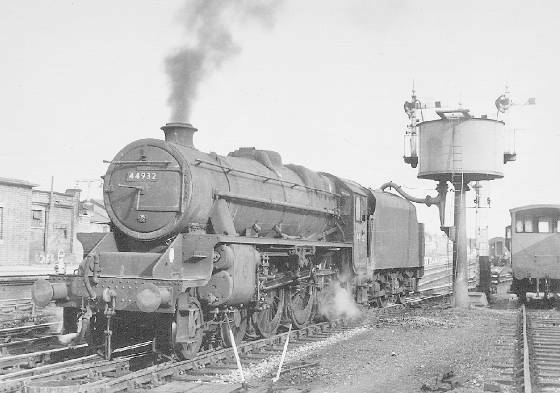 She then moved to Ardsley (56B) from where she was withdrawn in December 1962. 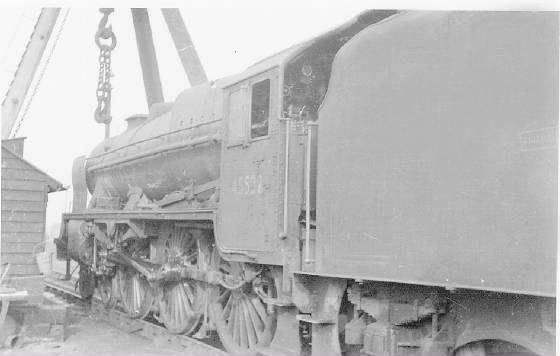 She was cut up one month later at Doncaster works. 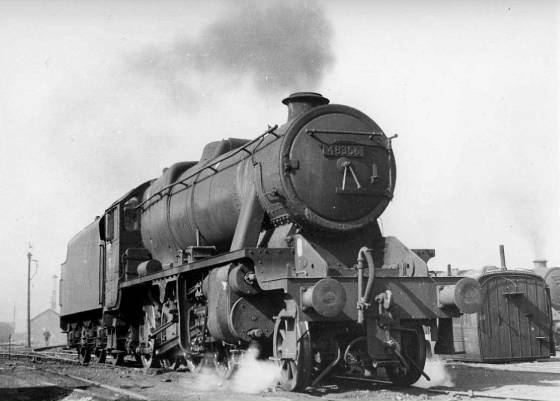 61856 stands on no.1 road on 28th April 1957. Newly-arrived "Black Five" 45116 stands proudly on no.1 road, ready for her next London job. "Black Fives": 44665 44717 44835 44847 44848 44932 44984 45215 45234 45301 45333 45334 45335 45342 45346 45406 45416 45450. "8F'"s: 48037 48057 48079 48141 48166 48168 48142 48293 48304 48324 48363 48378 48661. "9F"s: 92011 92013 92014 92030 92031 92032 92033 92043 92067 92068 92069 92071 92072 92073 92074 92075 92083 92087 92088 92090 92091 92092 92093 92094 92095 92096 92113 92132 92154. 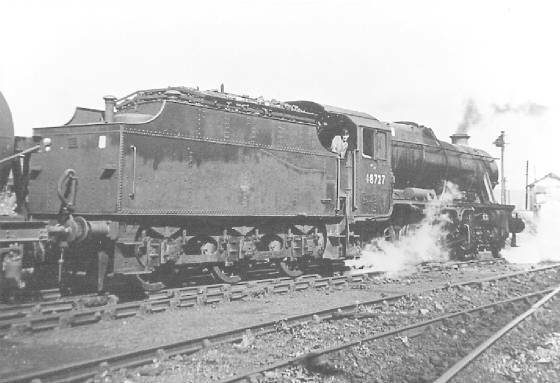 Partial closure in June 1965 left Annesley with just 21 engines, with many of these in store. 18 June 1965 - four days after (partial) closure! 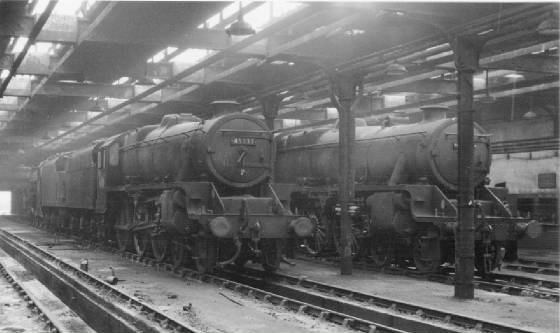 Four "Black 5's" stand on the shed front. Three months later Annesley closed completely. 70048 "The Territorial Army 1908-1958"
45522 "Prestatyn" stand under the "legs" in this undated view. 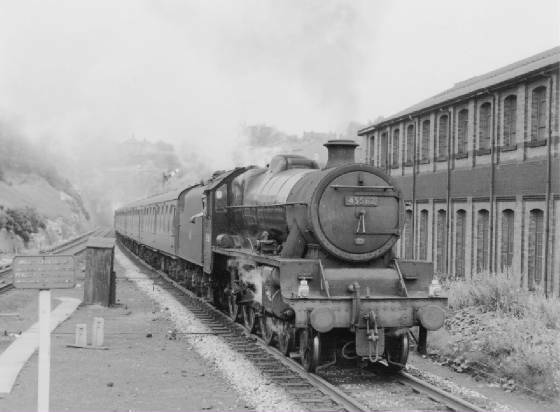 The Royal Scots came to Annesley in 1962 initially to replace our four Britannias and to work the diverted Manchester-Euston sleeper. Needless to say, we got all the clapped-out ones from other depots. Most drivers would have preferred a Black Five, and we borrowed V2's at every opportunity! 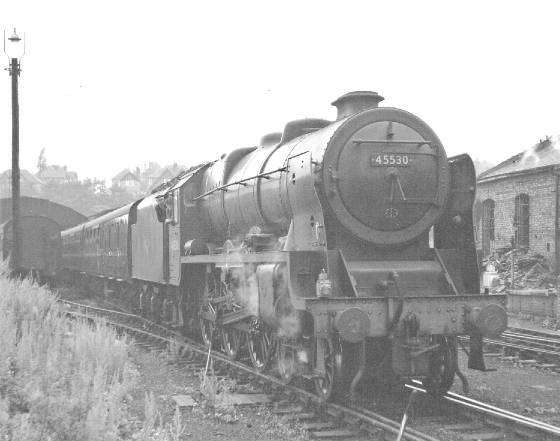 46143 "The South Staffordshire Regiment" was at Annesley from September 1962 to December 1963. 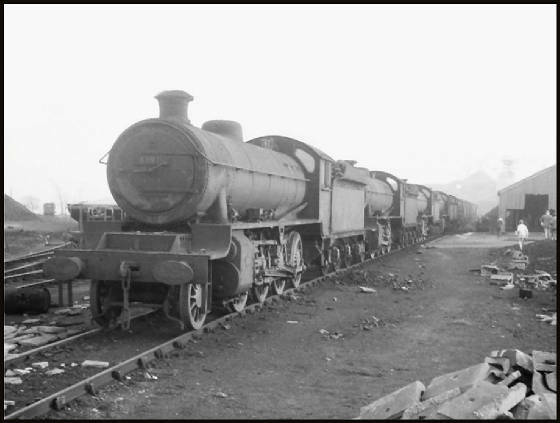 An extremely rare visitor in the background is Hereford (85C) "Standard 5" no.73096. On arrival at the Loco Depot I was kitted out with overalls and grease top cap and introduced to Fred Lees, the Chargehand cleaner. To say Fred was surprised to see me was an understatement! I was the first cleaner he had seen since Annesley was taken under the Midland Region's wing in 1958. 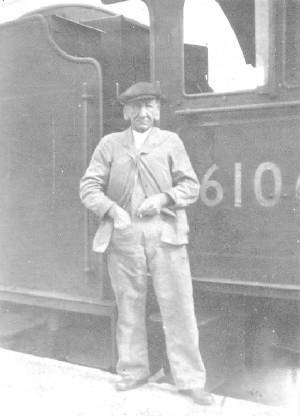 Fred was also in charge of the labouring force, and I was introduced to Shed Labourers Rueben Taylor (ex-driver aged 73), Johnny Holmes (Fred's general dogsbody) and Ben Sills, toilet attendant. He then sent me over to the canteen, presided over by Mrs. Harper, while he decided what to do with me! 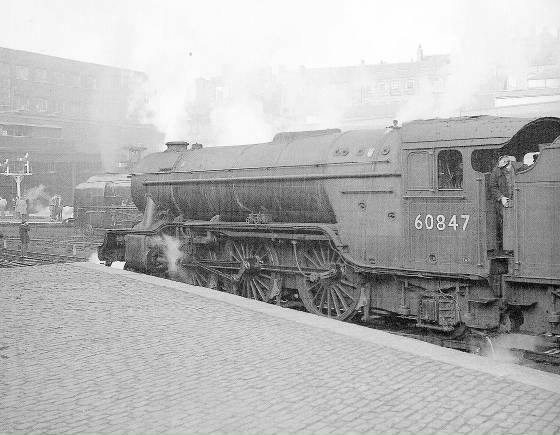 Driver Reuben Taylor is with "B1" 4-6-0 no.61066 in this early 'fifties photo. 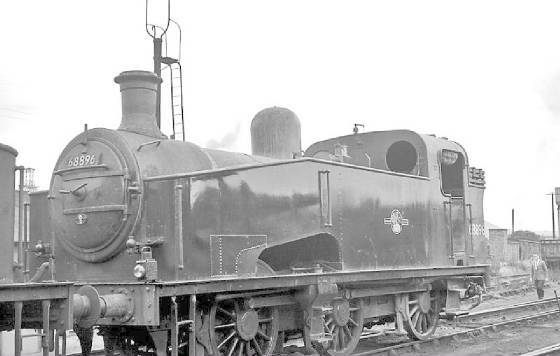 About an hour later Fred appeared and sent me to the stores to get a bucket of paraffin and some ”washed rags” (you could have as many of these as you liked, but only one white rag for polishing), and to clean all the cab numbers of the Annesley engines that were on shed. I was told I could do this all week and, so long as I kept out of the way, I could go more or less anywhere and do almost anything I liked! All this for the princely sum of £3 17s 6d per week! After my first (and only) week cleaning, as the eldest hand (and only) cleaner, Fred told me I would now be labouring, and I was given charge of sweeping roads 1, 2 and 3 as far as the water columns at the end of the shed front. I was convinced that I was on my way to my first million! The labourers' rate of pay was £8 8s 0d per week - this was as much as my dad earned at Hucknall No.2 colliery, and all my mates were earning about £3 a week! Around three months later I was joined by Graham Bucknall, (sadly killed at the age of 16 riding a high-powered motorbike), Joe Gibbon (the last I heard, he was at Shirebrook Diesel depot), and Pat Jarvis (latterly still working on the preserved G.C. at Loughborough). As they were all over the age of 16, they were soon passed out for firing - It didn't bother me as I knew that, as the eldest hand, as soon as I was sixteen I would always get firing turns, (and promotion through the links), before them. Saturday, December 10th 1960.. The great day had arrived! My sixteenth birthday and my first firing turn. 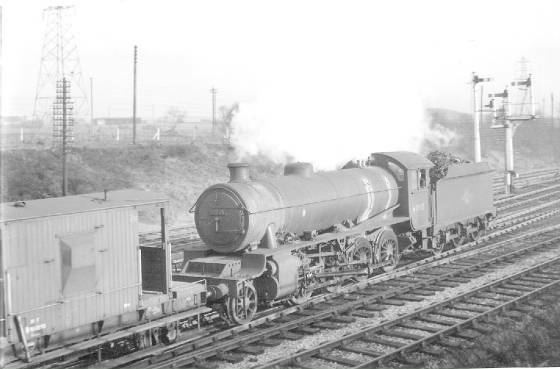 I would like to tell you the story of how I was called upon at the last moment to fire the York - Bournemouth express, hauled by a V2 2-6-2 from Annesley South Junction because the Sheffield Darnall (41A) fireman had gone sick. I'd like to, but it would be a load of rubbish! Photo from the Roy Warhurst collection. 92095 backs down from the ashpits followed by an "austerity"
During the first month or so, my forays on the main line were limited to (1) travelling to Bulwell Common on the railway bus, to relieve crews of "runners" whose eight hours were up. If down trains were "on the block" in Annesley Yard, It could possibly take another two hours before they got home. Not all drivers believed in as much overtime as possible! 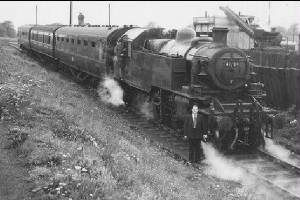 and (2) Relieving runners at Annesley South Junction and taking them onward to local collieries. ABOVE & BELOW - 92092 passing Annesley North Junction with empties. (incidentally, the term "runners" was used together with "windcutters" to describe the Annesley to Woodford "out and home" service, "windcutters" dating from pre-war days! I don't remember a great deal about that trip. Like most of our O1';s the engine steamed perfectly, she lifted the safety valves (a sin!) when coasting over the Midland, across Bennerley Viaduct (now a listed structure), and we rolled into Wichnor Junction on time. 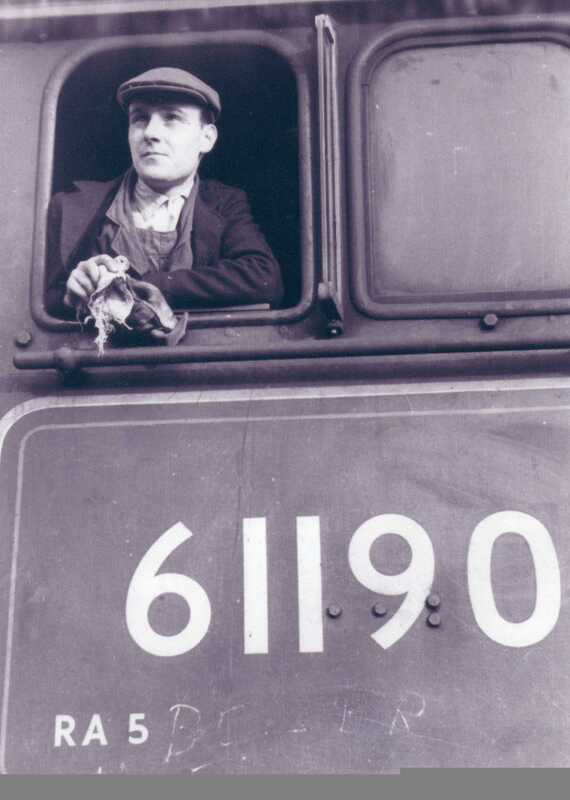 I remember feeling ten feet tall, waving to the trainspotters on Burton Station. 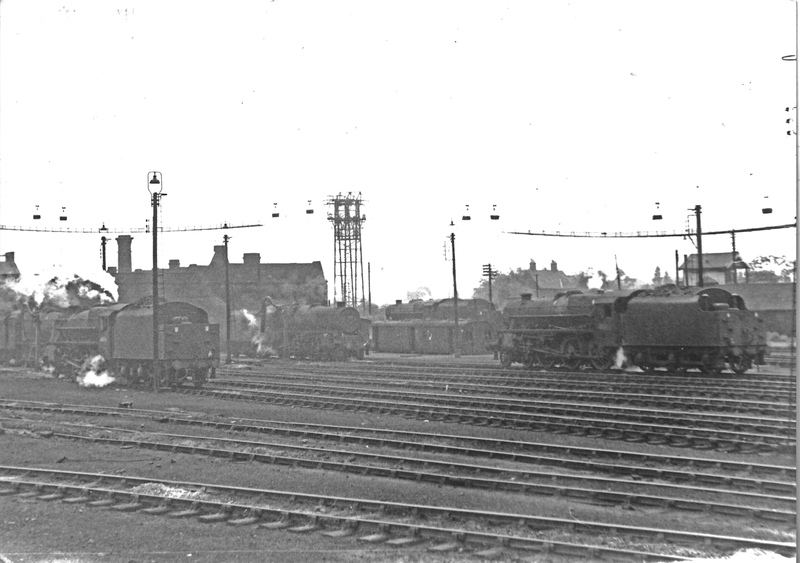 (Not many ex - L.N.E.R.engines went through the station, most workings by ourselves and Colwick men terminated in the G.N. 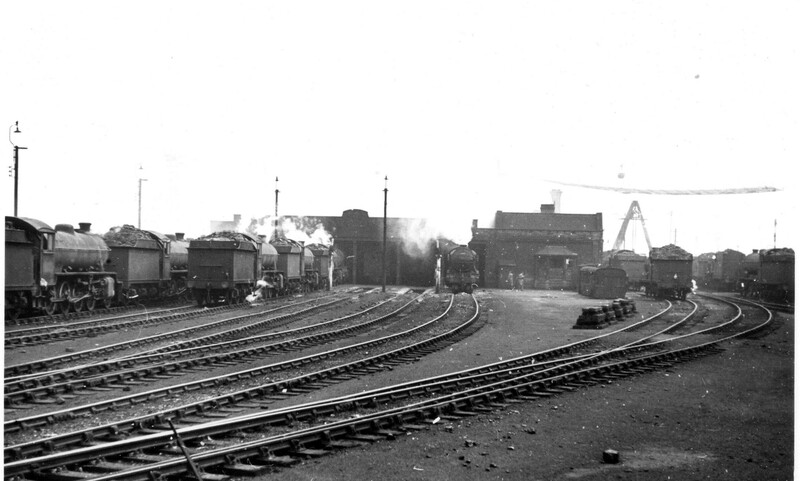 goods yard at Hawkin's Lane, north of the station). 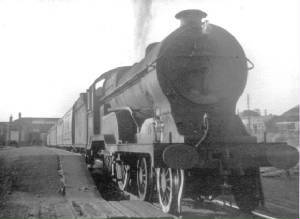 After the guard uncoupled, we went tender - first back to Hawkins Lane where we had our "snap". After about an hour's break, we watered and turned the engine and returned light to Annesley. 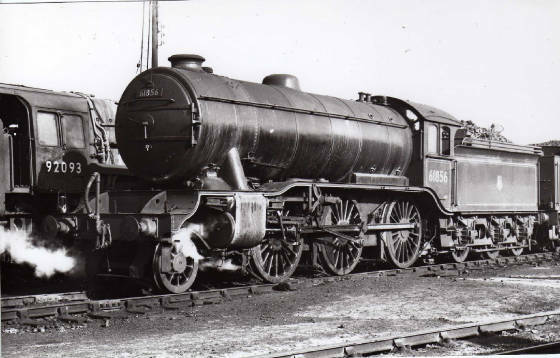 Little did we know that by the end of 1962, all our "O1's" would be withdrawn en masse and replaced by ex-LMS "8F" 2-8-0's! 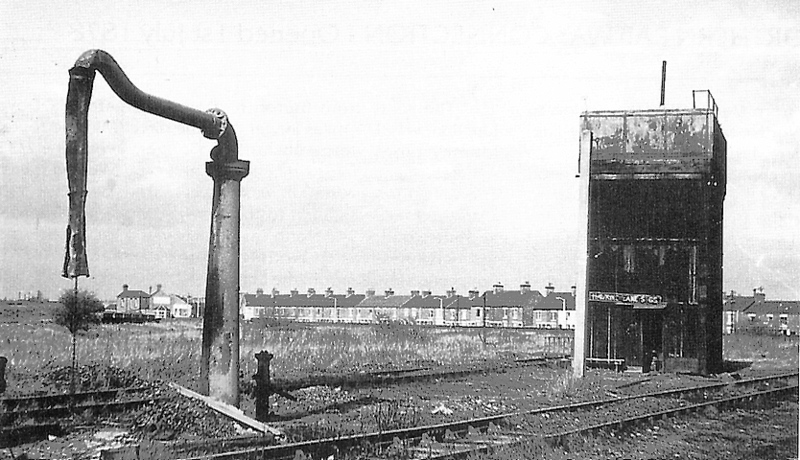 The GN servicing facilities at Hawkin's Lane consisted of a water tank, water column & turntable! 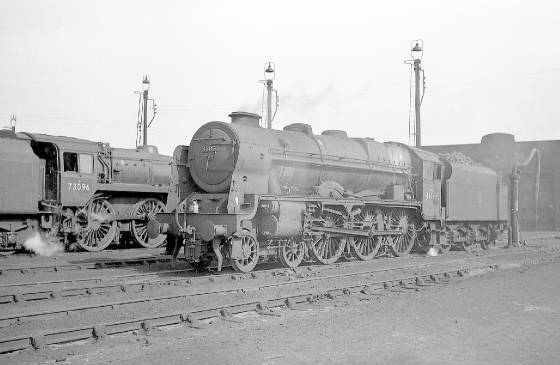 This 1959 view shows "O1" 2-8-0 no.63591 on a "top-link" job - the 10.17 Leicester pick-up goods! 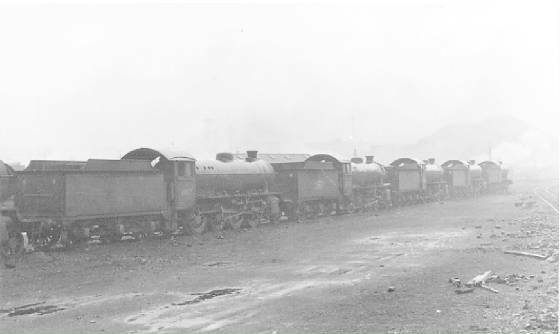 "O1" 2-8-0's nos.63752, 63817 and 63869 stand withdrawn on the "coal stacks" road. 28/10/62. Writing this reminded me of one of the most important lessons I learned in my early cleaning days. George and my pal Passed Cleaner Joe Gibbon were having a brew in the cab of a “Standard” (ex-L.N.E.R. J39) on No.7 Road. I climbed up to join them, and in the course of some light hearted conversation, I spat on the floor. Shock! Horror! George said “Chris, you never, ever, do that on the footplate! Remember - cleanliness is next to godliness!” That motto stayed with me all through my firing days, and I can proudly say that my footplates were always spotless. I would now like to list a few of my experiences with the many different types of engine that came on to the G.C. 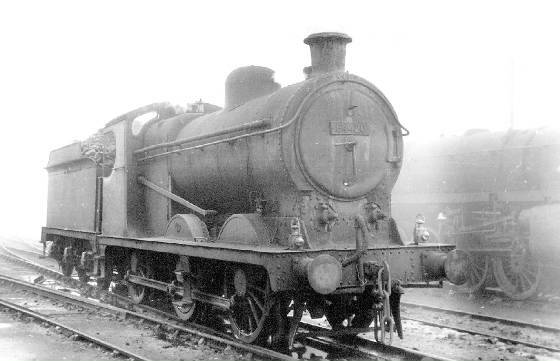 ex-BR 2-6-2 T 84007 in store: 13th Jan 1963. Withdrawn from Wellingborough (15B) one year later. 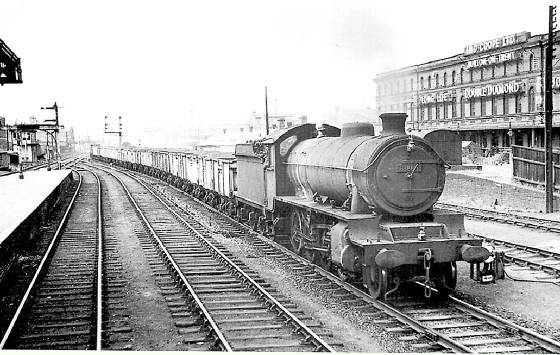 Although none of this class were ever allocated to Annesley, I fired them on the Queens Walk Goods Pilot turn. 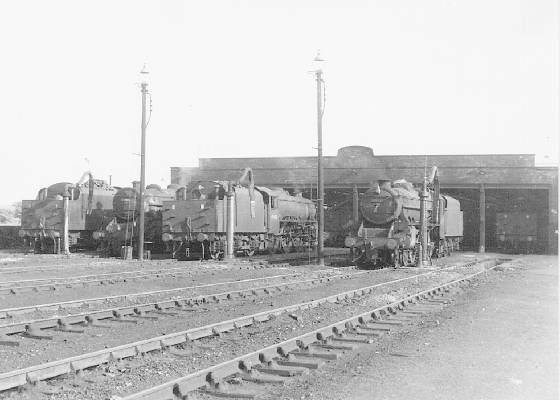 If you were to look in your Ian Allan A B C you would see that Annesley had two sub-sheds, Nottingham Victoria and Kirkby Bentinck. Colwick provided the engines for the ˜Vic Passenger Pilot, Gotham Pilot, and the aforementioned Goods Pilot. The six drivers signed on at Nottingham, but the firing vacancies (advertised every month) remained unfilled. It fell upon Annesley's passed cleaners and spare link firemen to do these demanding tasks. What a “doddle”! 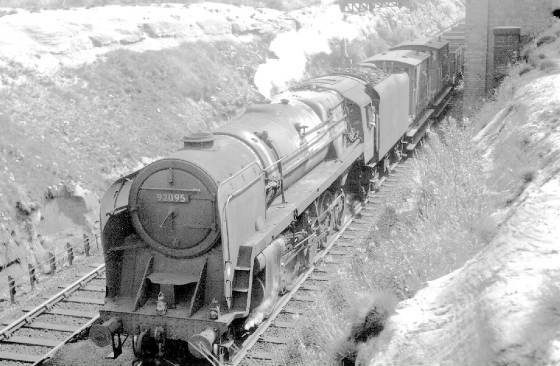 We were allowed ninety minutes each way travelling time, and on the Goods Pilot I would spend half the shift in the shunter’s cabin playing cards, a couple of hours mashing tea and eating and the other two pottering up and down the yard with Driver Sid Jones. If I was working my Rest Day, that would be 8 hours at time and a half, and 3 hours at time and three quarters - Seventeen and a quarter hours pay! The fact that Colwick always put their most run-down engines on this job didn’t really matter. 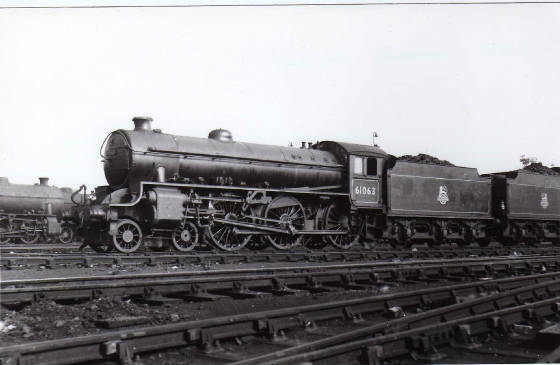 As a passed cleaner, I occasionaly had an ex -Great Northern “A” engine (L.N.E.R. 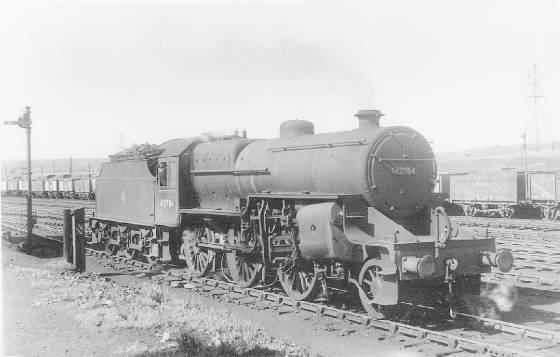 J6 0-6-0) no.64219 on this turn. You had to take two steps with each shovelful of coal to put it in the firebox! God knows how Leicester men used to get from Belgrave Road to Skegness on these old Crates. 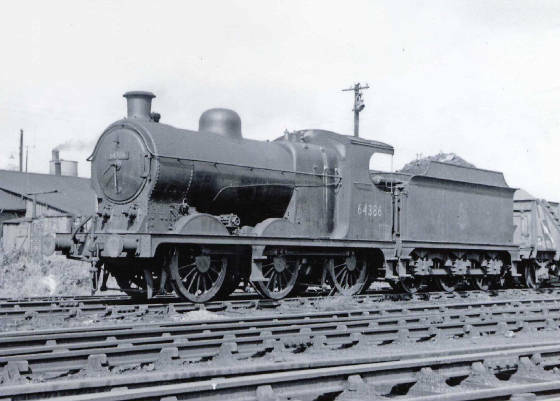 We also had Colwick "J50" 0-6-0T no.68927 a few times. another relic from Great Northern days! A rarity! - an ex-GN 0-6-0T with a 16D shedplate! 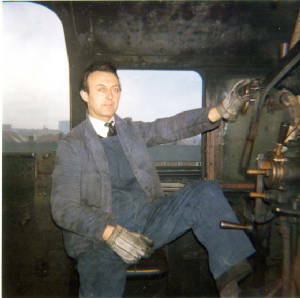 "I joined the railway as a cleaner aged 16 in May 1949 at Colwick MP Depot (38A). The legal minimum age then to be employed in or around a 'loco' being 16. After serving just over a year as cleaner I was passed out for firing duties and spent another 6 months or so in this capacity before being made Fireman proper. In those early days of firing, through lack of strength and technique due to inexperience, I favoured my chances of successful trips with ex G.C. engines as all that was needed to get them to 'gas' was to stand there and keep dolloping coal into the firebox. How I feared having to 'get her to stand round' when we had an ex G.N. engine, especially an 'A' engine. I recall that one day I was moaning to my regular mate Driver Bob Fearn that G.N. engines were 'deaf and dumb', in particular, ruddy 'A' engines. He replied that there was nothing wrong with the engines, it was me that couldn't fire 'em and that as for good engine, you'd never find a better one than an 'A' engine and in his opinion, they had the finest 'front-end' of any engine. Bob was sincere in these remarks by which time and experience on my behalf did prove the point. but if we had a K2 'Ragtimer' or better still; an 'A' engine, I was pleased as punch. My Dad was an ex G.C.R. man, started his career at Nottingham Queens Walk loco,(pictured below) then moving to Annesley when Queens walk closed in the early '20. Eventually he became a Driver there. My Dad had a morbid fear of G.N. engines and definitely didn't like to hear me say that one wasn't a fireman on the G.C., they were muck carters! Apparently, a vast difference was made to the engines performance by the way the eccentrics were placed, i.e. 'open' or 'closed', one system made for good starting, the other for better speed. With G.N. engines... they needed notching-up well whereas G.C. engines needed to be well down the rack. A G.C.engine in the hands of an ex G.C. Driver was great, but by the same rule one had to see the performance of a G.N. 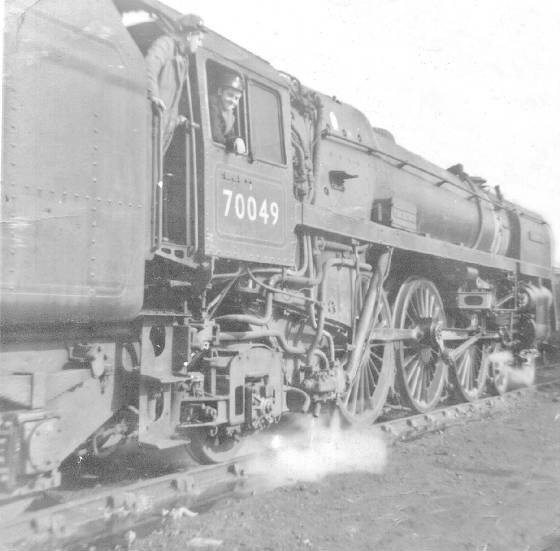 engine being driven and fired by G.N. blokes to see them at their best. No word of a lie... I simply think there was no engine to better an 'A' engine. 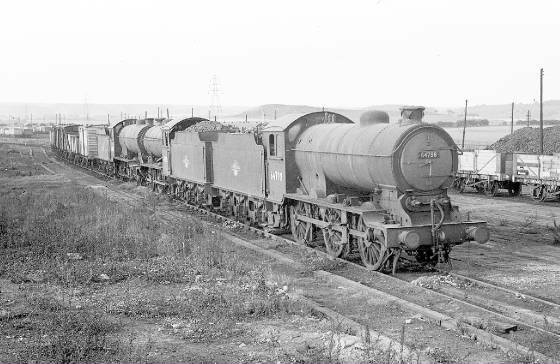 I should imagine they were one of the most economical class of loco's anywhere, either for fuel costs or in maintenance. 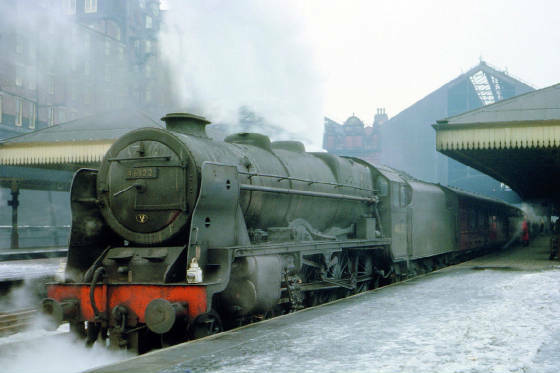 With a stopping passenger of 3/4 'hat-boxes' leaving Nott'm Vic' for Grantham, a thin red fire to start off with then 6 level shovelfuls round the box leaving every station would maintain 170lbs pressure and a boiler full of water all the way. I once proved this to a Driver Danny Barker who I fired for. 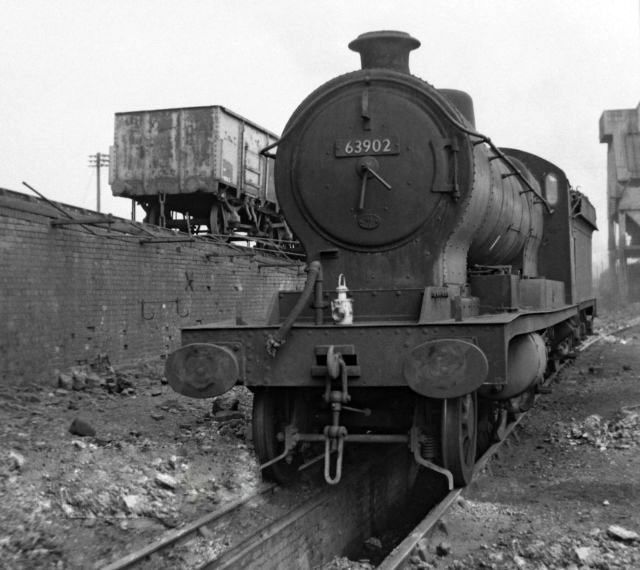 One more point I must make is the fact that Colwick Loco' got their coal supplies from Gedling Colliery... Coal! It was more like asbestos, what rubbish". Only once did we get the call to replace an ailing engine. A return Skegness to Derby Friargate job came in about half an hour down, with the engine priming badly. We swapped engines, giving them 61299 (below), and taking the cripple back to Colwick light engine. We didn’t tell the Colwick men that the engine they were taking wasn’t much better! 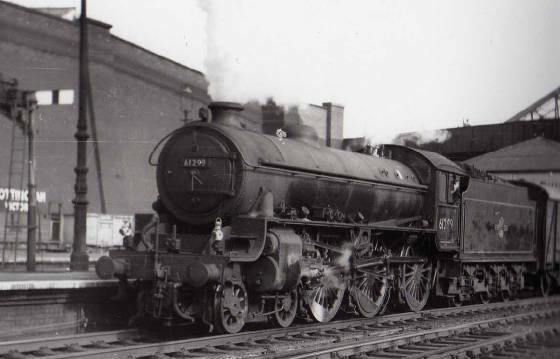 July 1961 sees "B1" 4-6-0 no.61299 on Notts Vic Passenger Pilot. My favourite driver on this turn was Ted Wills. Ted was an ex Tebay (11D) man, who came to “The Vic” for promotion. I think Ted still thought that he was banking trains up Shap! Every move we made was full regulator & cut-off. 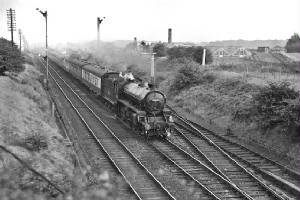 There were two regular main line turns for the “Vic” men, to keep their route knowledge up to date .They were the 5.55 am all stations to Sheffield on Monday, and the 10.40 stopper to Grantham on Thursday. I once worked this turn with Driver McDonald with a B1 instead of the usual L1 tank. He frightened me to death on the return journey by flicking the catch out of the reversing lever, sending it in to full cut-off, (with a wide open regulator!) between Radcliffe and Netherfield. 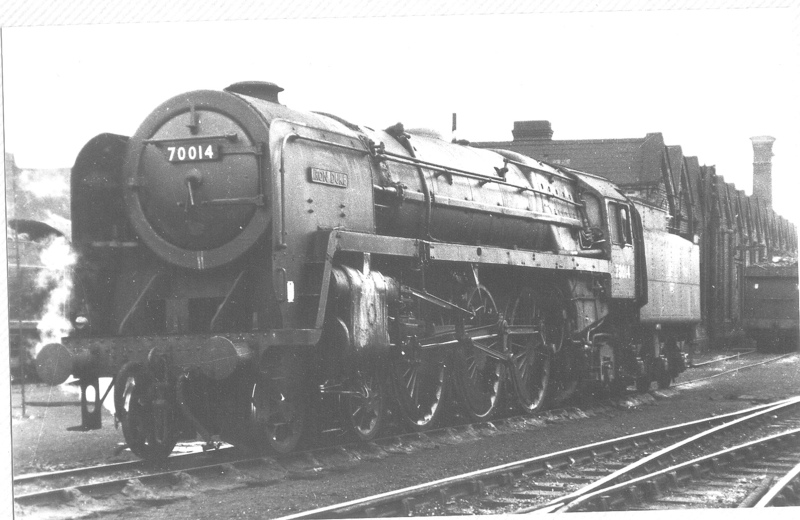 61264 (now preserved) stands in the bay on Passenger Pilot duty. 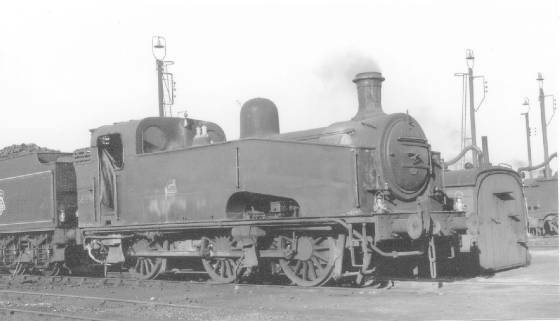 5MT 4-6-0 no.45190 facing north. Withdrawn from Heaton Mersey (9F) in May 1968. 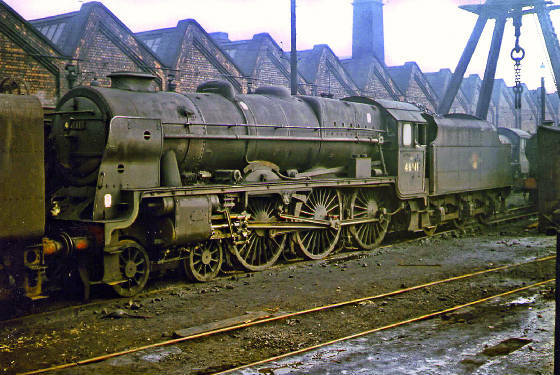 One depot that always maintained an excellent stud of "Black Fives" was was 8C Speke Junction (Liverpool). We used to work a special parcels train which ran from Liverpool to London for about three weeks, twice a year. This working was always hauled by an 8C engine, and it conveyed Littlewoods Catalogues (Spring & Winter issues). I worked this train quite a few times with my (favourite) regular mate, Jack Jordan. We used to book on at 19.25, quickly read the notices and catch the same Railway Bus back to Bulwell. After two pints in the B.R.S.A. we would then catch the Corporation bus to the Midland Station. 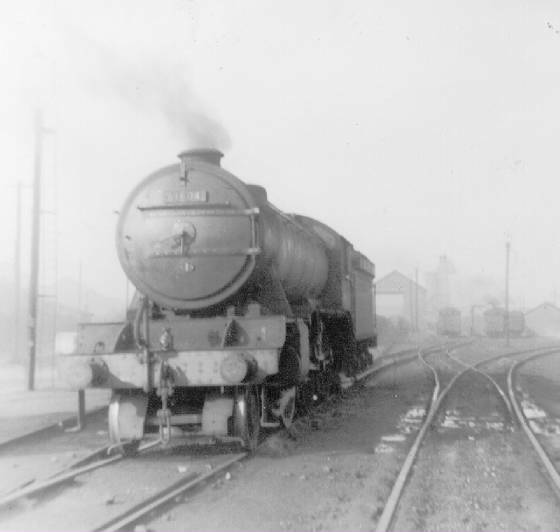 We then travelled on the only “express” on the Lincoln to Derby route, the “Tamworth Mails” leaving at 21.05 (always hauled by a Stanier 2-6-4 tank) to Derby, and on to Stoke on Trent by D.M.U. Two more quick pints before closing time then feet up for another hour. Another great job! We worked back over the ex -G.N. line via Egginton Junction and Derby Friargate to be relieved by a set of our own men at Nottm Vic. We would then get a lift back on a “Runner” to Annesley, Jack getting off at Bulwell, and myself at Hucknall. (Sending the Driver’s ticket up with the crew of the “Runner”, pinched us another half hour!) Twice we had a “Caprotti” Black Five on this job. I personally found them to be no better than their sisters. I remember one trip, when I was firing to Cis Bailey, we were working the Mondays only 05.50 Annesley - Sheffield Class"D" goods. 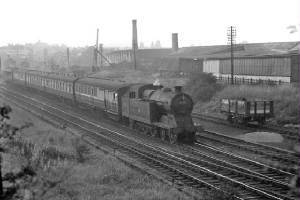 We were the first train northbound out of Annesley yard with Newton Heath allocated no.45076. Cis's method of driving was to wind the reverser back as far as possible as soon as we were under way. Unfortunately as soon as we entered Annnesley tunnel, we slipped...and slipped...and slipped to a standstill. After what seemed like hours stuck in the choking, red-hot, sulphorous atmosphere,(but was probably only 5 minutes!) Cis managed to get her moving again, and off we went on our merry way to Sheffield. 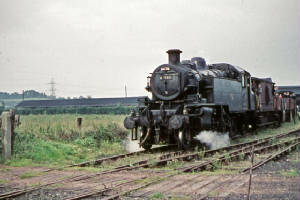 Annesley's 44932 (now preserved) takes water at Bulwell Common while working the Basford pilot turn. 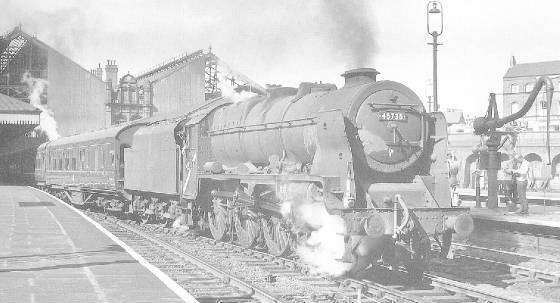 The only "Jubilees" allocated to Annesley were 45626 "Seychelles" from November 1962 to January 1963, and 45735 "Comet" from October 1963 to her withdrawal in October 1964. A Millhouses "Jubilee" and an Ardsley "B1"
"Jubilee" 4-6-0 "Hawkins" (17B) has just dropped down from the ashpits on a dull evening in 1962. Fireman George Hunt looks back as 45735 "Comet" departs with the Mablethorpe - Leicester . The only time I fired a “Jubilee”, was when I was booked with Driver Stan Taylor for a week in October 1962. We were rostered on the 23.40 Annesley-Woodford. Stan was an excellent mate to be with, and every night he let me drive the return "Runner" back to Annesley. However, this was a No.2 (Passenger) Link working, and on Saturday 21st, we were rostered to return with the "Newspapers" the crack G.C. train of the time. We'd encountered patchy fog all the way up, and were twenty minutes down on arrival at Woodford. After we had dashed over to Woodford station, we found out that the "Papers" was running half an hour late, so we had a little more time to eat our food. On being told that our train was passing Culworth Junction, we went on to the platform ready to relieve the Woodford men. Through the fog loomed No.45639 "Raleigh", (a stranger to the G.C). As the crew got off, the fireman said "She's a good ‘un, mate", - and she was! Apart from the fact that I couldn't sit down due to the rough riding, (Stan wasn't letting me drive this one!) She steamed like a dream! And would you believe it - both injectors actually worked! 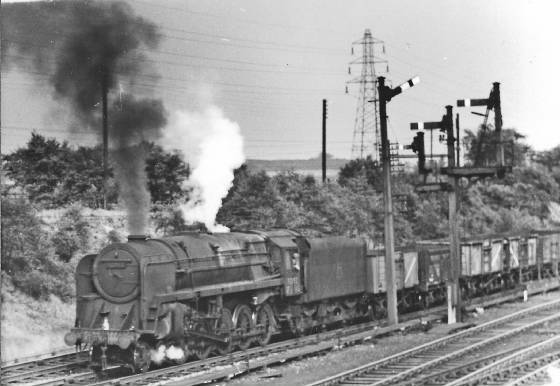 (You will have gathered by now, that the injectors on Midland engines were unreliable) Going up Shawell bank between Lutterworth and Rugby, the 3 cylinder "Jubilee roar" from the chimney top was fantastic. While I was clinging on for dear life going down Ashby bank, on passing Whetstone Stan shouted that we were doing 89 miles an hour! This was the fastest I ever went in my railway career. We arrived in Nottingham Victoria having taken 22 minutes for the 23 miles from Leicester Central, start to stop! Below is a photo of 45639 taken the previous day, working the 11.15 Nottingham - Marylebone parcels. In 1962/63 we had the misfortune to "acquire" some of the "crème de la crème" of the hated L.M.S. 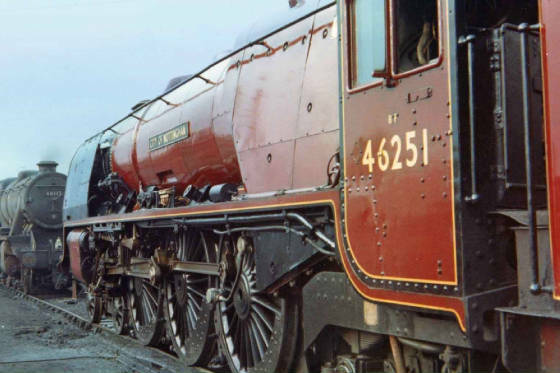 Yes, you've guessed - the famous "Royal Scots" together with “Rebuilt Patriot” 45529 "Stephenson" and “Rebuilt Jubilee” 45735 "Comet". 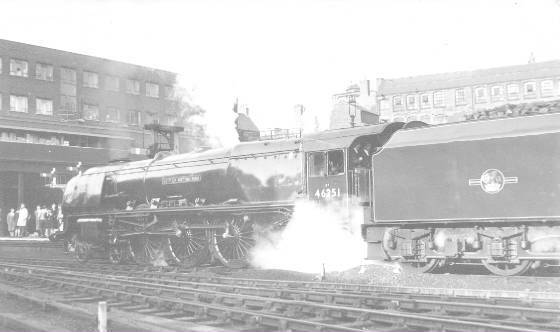 They were supposed to be for the Manchester to Euston "Sleeper", diverted to Marylebone over the GC due to the Euston electrification, and the Marylebone semi - fasts, but we were quite happy with the Black Fives, even though it was pushing it a bit with "eleven on" on the Sleeper. The "Patriot" was immediately relegated to local freight and pick - up work. We soldiered on with the "Scots", but they were poor tools. Apart from being impossibly rough riders,they were often in trouble with inexperienced firemen, due to the long narrow firebox. My first contact with a "Scot" was about nine months before they came to the G.C. I was in the Relief Link at the time, and was booked with my regular mate Jack, on the 06.20 all stations (including Rushcliffe Halt!) to Marylebone, which we worked as far as Woodford. 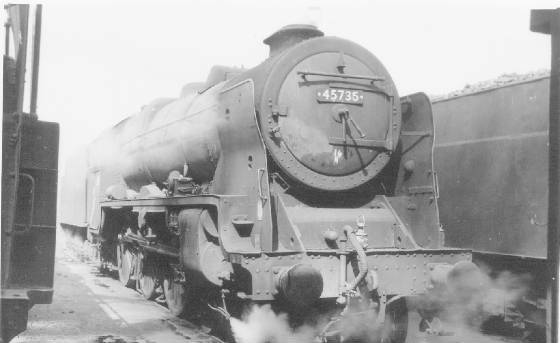 After three days with Black Fives, we arrived at work as usual at 04.25 on the Thursday to be given 46163 "Civil Service Rifleman". 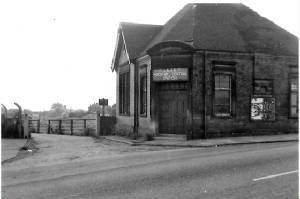 This was about eighteen months before it was transferred to Annesley, (during which time its condition had deteriorated considerably). Anyway, given the fact that we only had five coaches on, and that this train was allowed over four hours to get to Marylebone, the only difficult part about it was to stop the safety valves lifting! "Royal Scot" 4-6-0 46101 formerly "Royal Scots Grey" stands outside the shed shunter's cabin. However, my next trip on a "Scot" was a little bit different. As I mentioned earlier, I was with driver Tommy Howlett on the Manchester-Marylebone Sleeper. Tommy was a veritable mine of information about non-railway matters – he showed me where Charles Peace the murderer used to live, (opposite Darnall Station) and where Lady Chatterley did all her shenanikins (over to the right passing Heath station, near Sutton Scarsdale Hall) But I digress………After two trouble free days with Black Fives, we booked on as usual, to be greeted by Running Foreman Lol Crampton with the words "Reginald Maudling (the then Chancellor of the Exchequer) is on the train tonight, don't be ******* late!" 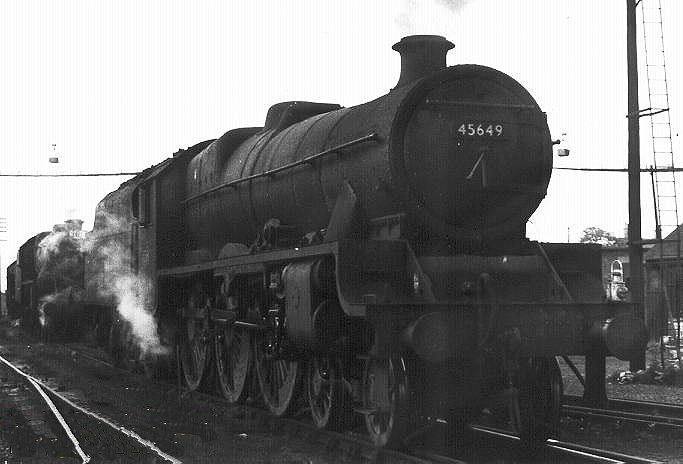 We had a borrowed "Scot" 46155 "The Lancer", and a tender full of best passenger coal. When we arrived at the 'Vic, we were again informed that the Right Honourable Gentleman was on the train, and that it was (unusually) running to time. In it came, hauled by the usual E.E. Type 4, and ten minutes later, we were away. Crossing the Trent, Tommy had her wound back to 25% cut - off and full regulator. I was firing "text book" style (eight shovelfuls at a time, waiting for the smoke to clear at the chimney top, then another eight). Passing East Leake, the needle was just off the red mark, with the exhaust injector on, and the water in the top of the glass. On clearing Barnston Summit, Tommy eased the regulator for the drop down to Loughborough. Immediately, she started to blow off, and I went over to put the live steam injector on. The bloody thing wouldn't work. As Tommy applied the brakes to slow down through Loughborough Station, the exhaust injector blew off as well. We came to a stand at Quorn 'box with the safety valves roaring and a quarter of a glass of water! The prospect of throwing out the white - hot fire was not very pleasant! Just as the water was in the "bottom nut" we finally got the live steam injector to work and eventually limped into Leicester twenty-five minutes down. I don't suppose Mr. Maudling even turned in his sleep! As we limped on to Leicester MPD, we could hear the Cockneys roaring up Ashby bank with the replacement Black Five they'd been given. Trust this to be the only time we were late all week! The only time I am aware of that a "Coronation" worked on the G.C. 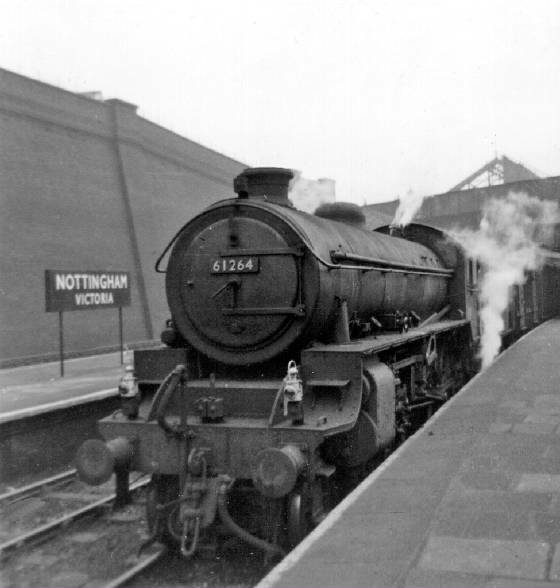 was on Saturday May 9 1964, when 46251 “City of Nottingham” hauled an R.C.T.S. railtour from Nottingham to Swindon. 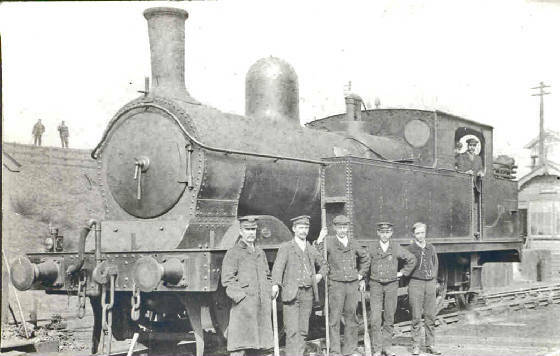 Driver Eddie Foley and Fireman Arthur Gibson worked this train as far as Woodford. It was the only time I ever saw them wear regulation "greasetop" hats! - Eddie usually wore a flat cap, and Arthur a beret. This was obviously because Inspector Weevins was accompanying them! The "Pacific" arrived on shed at 3.35 pm on Thursday 7th May, and the next day was spent getting her ready for the job in hand. 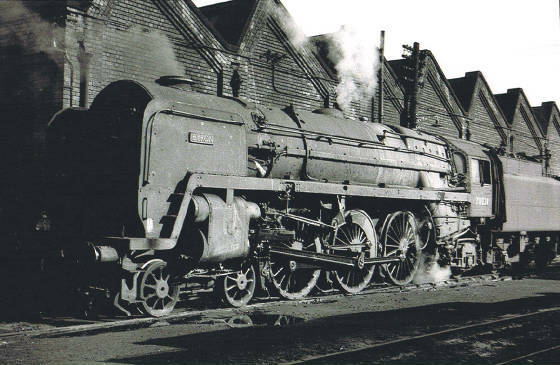 However, as management didn't trust ex-LMS engines 100% (and after the "Royal Scots" fiasco, who could blame them!) 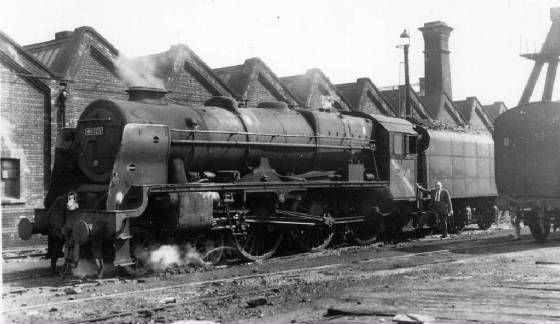 at 11.30 pm on Friday 8th May, "V2" 2-6-2 No.60847 "St.Peter's School, York A.D.627" was prepared as standby engine! Driver Eddie Foley and Inspector Weevins are chatting prior to departure. It was Arthur Gibson incidentally, who gave me my first trip to Woodford. 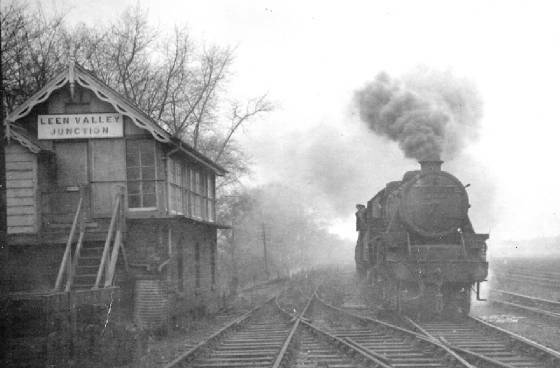 It was in March 1961, and I was 13.55 P & D. Now on this turn, Annesley 'Loco was so busy in the afternoon, that it was not unusual to be back on the Railway Bus at Six o'clock, or even Half past Five. Arthur was in No. 3 Link at the time, and was booked on the 14.30 Bulwell - Woodford. Walking down the cinder track to the 'Loco on the Tuesday, he asked me if I wanted to swap turns for the rest of the week. After two seconds hesitation I agreed, and so on the Wednesday I climbed aboard 92010 for my first trip on a "Runner". This was the first time I'd been with Driver Jack Jordan, and we hit it off straight away. Now Jack was "well in" with Horace, the List Clerk, and it was no coincidence that when I was made a Registered Fireman, I moved into the No. 6 Relief Link as his regular mate. 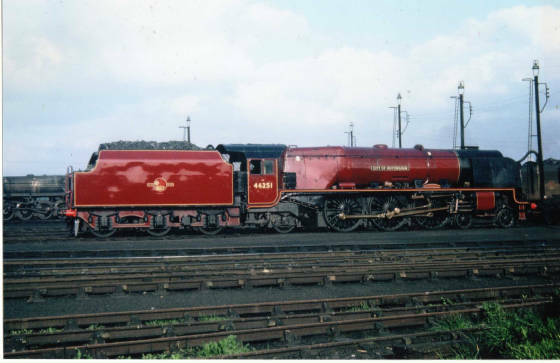 Autumn 1962 brought about the biggest change of motive power at Annesley since the “9F” revolution in 1957. 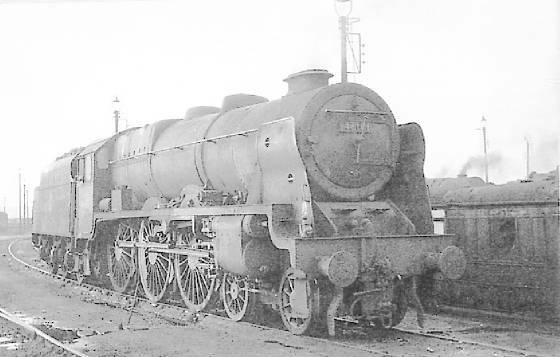 All our “O1” 2-8-0’s were taken out of service and replaced by ex-LMS class”8F” 2-8-0’s. While on paper this seemed a fair swap, in practice (as usual) Annesley got the worse of the deal! One would think that the “8F”, being the more modern locomotive, would be vastly superior to the ex-Great Central “O4” rebuilds. No way! When cleaning the fire on an “O1”, the fireman could whip out four of the firebars, push the clinker through and have the firebars back in less than half an hour. Not so with the “8F”s! the firebars were twice the length and weight. This, together with a longer firebox made the fireman’s job much more arduous. Whilst once under way they could pull as well as the "O1's", they were less sure-footed, heavier on coal and water, less comfortable, had less reliable injectors and also poorer braking power! However, they were vacuum fitted, so they could be used on fitted freights. In practice though, this seldom happened. We used them on the Stanton Ironworks diagrams, and all the local workings, Colliery jobs etc. 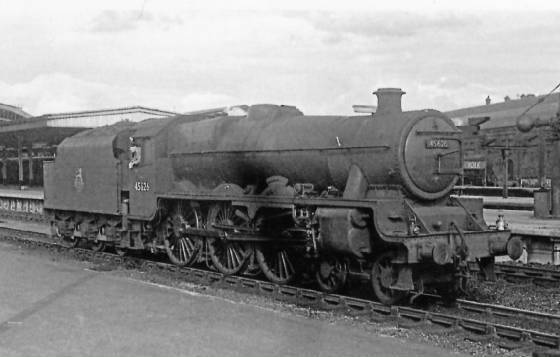 June 1962 sees one of Annesley's "O1" 2-8-0's 63806 (above), recently ex-works. Sad to think that only four months later she would be withdrawn from service! 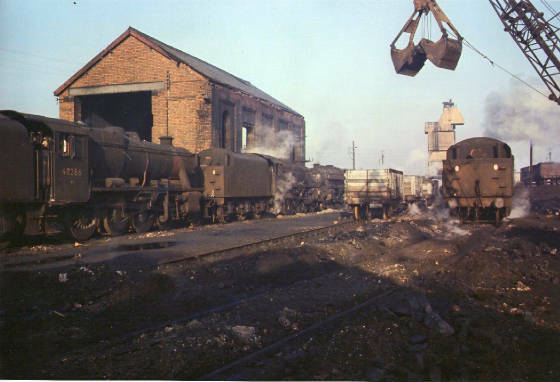 28th October 1962 sees "O1" 2-8-0s 63752, 63817 & 63869 waiting the call to the scrapyard. 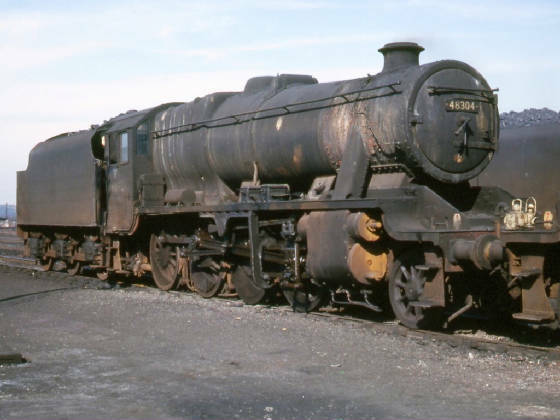 Ex-LMS "8F" 2-8-0 no.48356 stands outside the Shed Shunters cabin in May 1965. 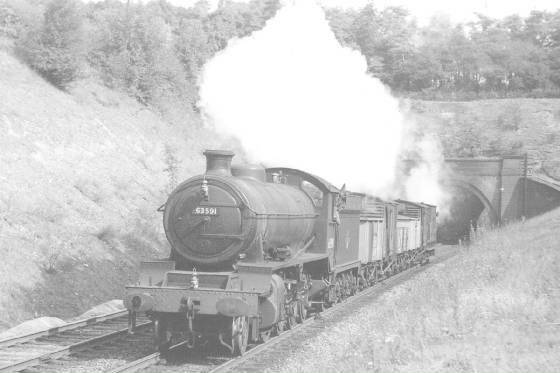 One job we had was relieving the 13.40 ex-Silverhill Colliery at Newstead (GN) and working onward to Stanton, arriving at 17.16. 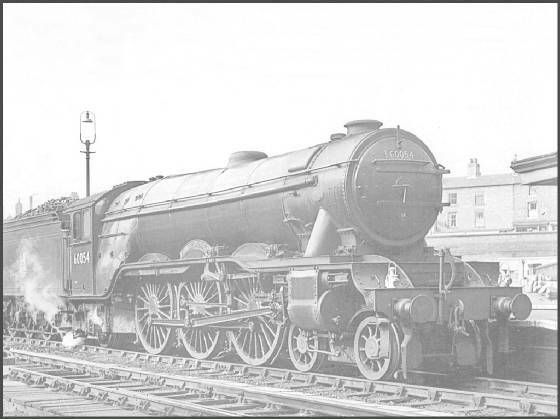 22nd November 1963 saw Driver Wallace Walker and myself working this train. We arrived at Stanton on time, disposed of our empties, and were sat having our "snap" when the head shunter came out and told us that U.S. President, John F Kennedy had been assasinated! 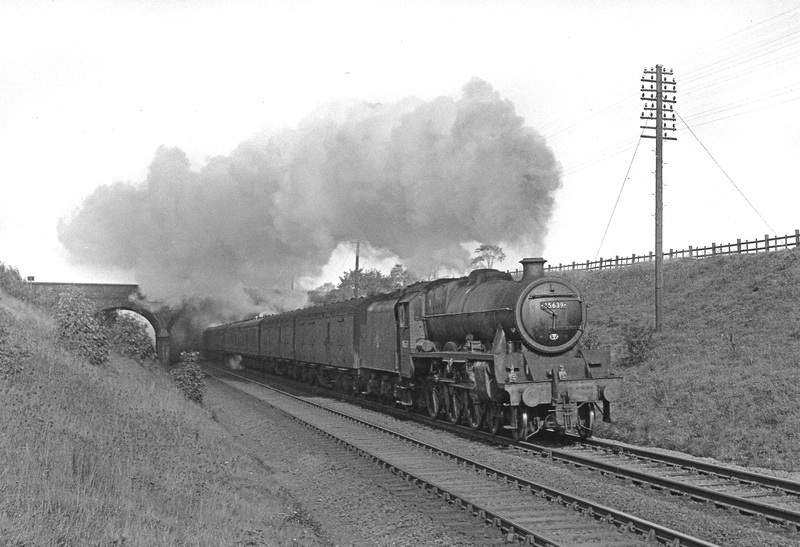 My final two "8F" turns before leaving Annesley for Toton in 1965 were both with 48293. Sunday 21st February saw me on a Kimberley Ballast working with Cis Bailey, and three days before I left I was with Pete Harrison on the 06.50 Staveley job. Click here to see probably the best railway website on the internet!.....The David Hey collection. Compare this photo with (below) the one of 61804 taken just seven years earlier! .....and now the demolition men have moved in! 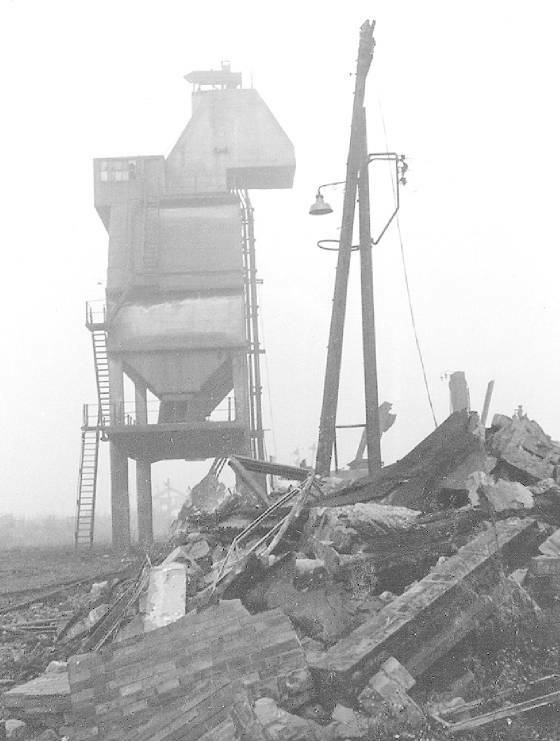 October 1966 - the ashpit cabin is a pile of rubble. 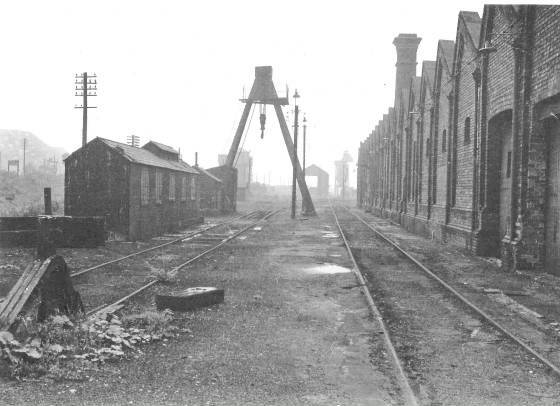 The view across the shed front towards the coaling plant.